Monday April 7th 1902 An awful cold windy day. I was sewing all day when not busy with the cooking. Will began to put in oats on the ground he rented north of us. We have another man to work. Tuesday April 8th 1902 It was quite a nice morning. I hurried through my work and went down town. I brought Mother out to spend the day. We had a nice visit. Mollie took her home after school. Wednesday April 9th 1902 I did baking and was busy in the kitchen most of the forenoon. I did some mending and read and wrote some in the afternoon. I felt too tired to do anything more with my dress. 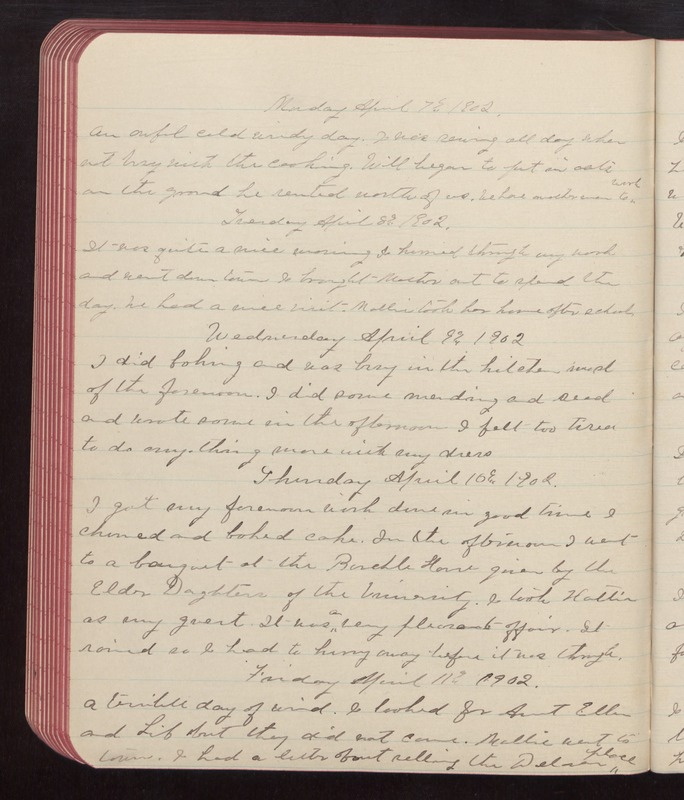 Thursday April 10th 1902 I got my forenoon work done in good time. I churned and baked cake. In the afternoon I went to a banquet at the Burchle House given by the Elder Daughters of the University. I took Hattie as my guest. It was a very pleasant affair. It rained so I had to hurry away before it was through. Fruday April 11th 1902 A terrible day of wind. I looked for Aunt Ellen and Lib but they did not come. Mollie went to town. I had a letter about selling the Delevan place.